How to Outsmart Burglars & Protect Your Gun Safe? #1 How to Outsmart Burglars & Protect Your Gun Safe? Gun owners are becoming more of a target to burglaries and this is because of the ease with which a gun can be sold on the black market and if the gun is clean, the criminals will be able to get even more for your expensive gun. Gun safes are the real target here and many people think that their gun is safe when they buy a 1000 pound gun safe, but the fact of the matter is that even these gun safes can be easily moved and stolen using some of the common household items like carpets and having a lot of time. When the safe has been moved and stolen, the burglars will be able to take their time in opening your safe and thus you could lose everything. Most of us only focus on keeping people out of the gun safe, but what if an intruder decides to move the entire safe? How can this be stopped? Well, luckily there are a few methods that can be used to ensure that you gun safe is never moved and these can even be used on smaller gun safes. With these features, intruders will have a tough time finding the weaknesses of your safe and you can rest with peace of mind, knowing that everything is protected. These 4 ways might sound like common sense to some, but it could possibly save all the personal belongings of another and even though something is common sense, how many times have we neglected to follow common sense. 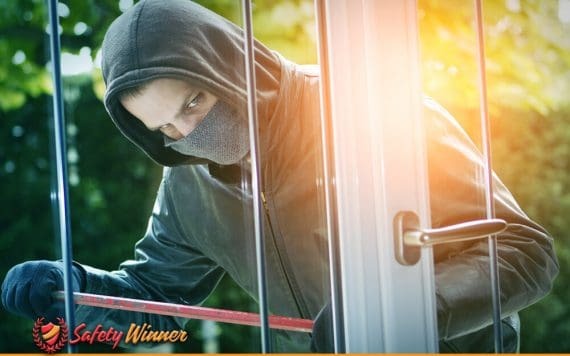 Last year in the US, there were more than 3.9 million burglarized homes and only a small fraction of them were caught and the items recovered. By using these tips, you will be able to ensure that you do not become a victim of gun safe robbery. It is not worth it to take any risks and to leave the safe lying around for a couple of days as you do not know when someone is targeting your house. The mounting process of gun safe is usually tough and it might even require you to have a little basic knowledge of household tools, but even if you do not have this knowledge, I recommend that you find or pay someone to do it for you. When a safe is dead bolted, the weight increases by almost 4 times and you will now have the power of the ground and wall to assist the safe. It is not easy to remove these deadbolts from the outside and it might require heavy machinery that the burglar will not carry around with them. Alarms have leaped in the past few years in terms of development and theis can be used to your advantage. Hollywood also demonstrates this, but unlike the stuntment of the cinemas, an average burglar does not possess all of these skills to duck and weave through the sensor and sometimes they will not even look for the sensor. These alarms can be connected to your mobile device and you could possibly get a notification if someone is trying to get in to the safe. This will give you time to call the cops and try to catch the robbers and if the safe is accompanied by a sound system, you could possibly scare off intruders with the sound of the noise. Alarm sensors can be expensive, but they are a great addition to your home in many ways, but especially when it comes to guarding your safe when you are not at home. No one ever recommend this, as it is expensive, but sometimes your valuables inside are worth protecting, especially if they cannot be replaced. Concealing your safe does work best with in-wall gun safes as they have been created to be hidden inside wall structures and behind paintings. But with smaller box designed safes, you will also be able to hide the safe in difficult to find places. If you happen to have a strong and sturdy table, you could find a spot and mount your smaller safe to the bottom of the table and this will make it hard for intruders to see the safe and they will need to waste a lot of time in finding the safe. The reason why so many safes are stolen is because the owners of the safe simply do not care about where to put the safe and generally most people store their safes in the closet. This will be the first place to start looking as an intruder and then they will have all the time in the world. If you do not go away a lot, you would be wise to keep the safe close by. During the evening when most burglaries occur, it will be beneficial to keep your safe close by. The advantage of keeping the safe close by is enormous and you will not only be able to get faster access to your firearm, but the intruder will need to get past you in order to try and get to the safe. When you have faster access to your firearm, you will be able to protect yourself much better and this could be hugely advantageous in life and death situations. Intruders are also more likely to skip the safe when they know that the safe is close by the owner and the owner is constantly at home as sometimes it is internal betrayal that tells the intruders where the safes and valuables are inside the home. I would like to thank you for reading this article and I hope that you now understand how overrated the weight actually is. Weight will be a barrier to keep people out of your safe and keep them from stealing the safe, but it will not do this for a very long time, unless you can arrive on time.